Get a Service Quote Today! We have been excavating for over 15 years. We have the right equipment to help you accomplish your mission with excellence and on time. Whatever your excavating need is, we can do it. We excavate for commercial and residential applications. We have worked in Davis-Monthan AFB, Raytheon, the VA Hospital, and the University of Arizona. We also specialize in Auger holes from 6" to 3' diameter. Grading has always been a part of our business model. 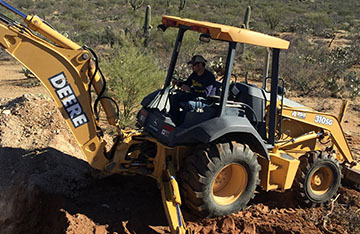 We specialize in rough and final grading, and privately owned dirt roads. You can count on us for your grading needs, we are efficient and professional at what we do. We work hand in hand with residential and commercial contractors, and we provide a great service to all our customers. Look no further, we are ready to serve you and give you a positive customer experience! 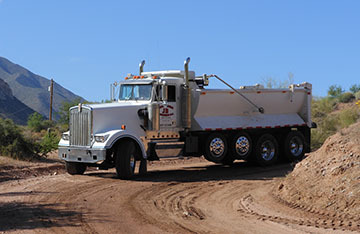 We have a simple 14 wheeler dump truck that allows us to haul any material needed for a job, as well as, dispose of any trash from the job site. Our drivers are CDL licensed and have plenty of experience hauling heavy equipment. Give us a call or request a quote below and we will get back to you in an efficient manner. If we can't help you, we will redirect you to our most trusted working partners. 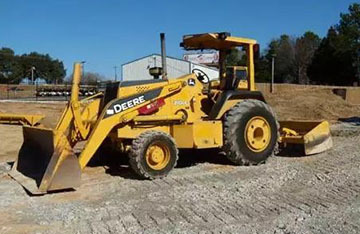 Do you have heavy equipment that has not been properly maintained? We can help! 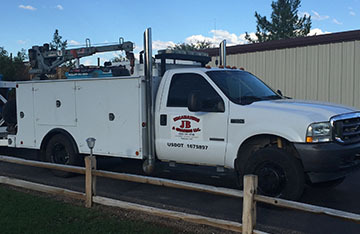 Our service truck is equiped with all the necessary tools and consumable products we need to troubleshoot your equipment, and get it back up and running on time. If you have equipment that just needs periodic maintenance, we can also help you. JB Excavating & Grading, LLC exists to help our customers accomplish their mission. We work as a team, whenever we are entrusted with projects. We have all the appropriate tools & equipment to accomplish your mission efficiently! Just give us a call, or fill out the service request form, we are ready to serve! We have been serving the construction industry for some time now, we know how to properly operate the equipment you need, and we are ready to help you accomplish your mission. Our years of experience have taught us that reputation is made through good business. We live up to high quality and service standards, and customer satisfaction is our priority. We only trust our equipment and our customer's mission to a selected few. Our personnel has been trained and tested, both, at school and in the field. You can trust us with your next excavation or grading project. We understand how valuable time is to you. We accomplish every task we are assigned, at the time we promise to complete the job. Let us be a part of your next project and you will see the difference we can make. "We take passion and pride in every job we are hired to do. We are efficient at what we do, and treat every customer with a high level of respect." We are committed to serve the construction industry with high quality excavating and grading services. We provide top notch services and timely completion of all projects to all of our customers. MAKE US YOUR PARTNERS IN YOUR NEXT PROJECT! We look forward to work with you, and help you in the timely accomplishment of your next operation. Copyright 2015 JB Excavating & Grading, LLC.